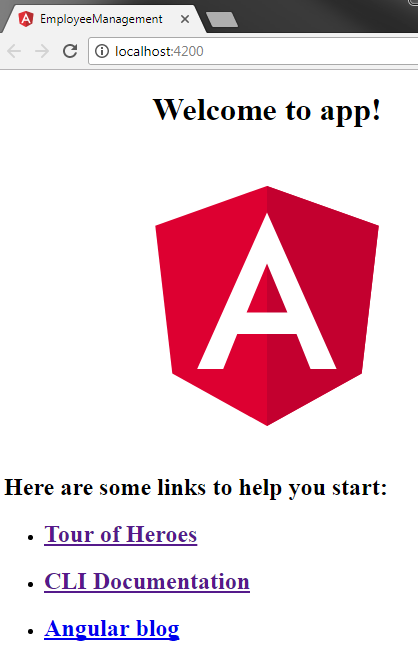 Implementing routing in an Angular application involves many small steps. Angular CLI does a pretty good job in having some of these routing steps implemented out of the box by just using --routing option. Before we discuss, how we can use Angular CLI to implement routing let's setup routing manually so we understand all the moving parts as far as implementing routing is concerned. Using the following command, first create a brand new Angular project using the Angular CLI. We named it employeeManagement. Let's assume we are using this application to manage employees. Out of the box, Angular CLI has created the root component - AppComponent. In addition let's create the components in the table below. The table shows the component name, it's purpose and the routes we are going to use to get to these components. Let's generate the above components using Angular CLI. Use the following commands to generate the components. Angular CLI not only generates these components, it also imports and registers the components in the root module. This builds and launches the application and you will see the following page. Step 1 : Set <base href> in the application host page which is index.html. The <base href> tells the angular router how to compose navigation URLs. This is already done for us by the Angular CLI, when we created this project. Notice the URL in the browser. We have /home in the URL and we see 'home works'! displayed. Now in the URL remove '/home', and type '/employees' and press the enter key. Notice the message 'employees works!' is displayed. Now in the URL remove '/employees', and type '/abc' and press the enter key. '/abc' is not a valid route so the message 'page-not-found works!' is displayed. Now remove '/abc' from the URL and press the enter key. Notice we are redirected to '/home' (the default route) and 'home works'! is displayed. Step 5 : Tie the routes to application menu. Routing is working as expected, but we have to manually type the URL in the address bar. Instead let's include links to our home and employees routes. Let's do this in the Root component(AppComponent). Include the following HTML in app.component.html. At this point build and run the application using the following Angular CLI command. Routing should be working as expected. When a route is active the routerLinkActive directive adds the active CSS class. When a route becomes inactive, the routerLinkActive directive removes the active CSS class. The routerLinkActive directive can be applied on the link element itself or it's parent. In this example, for the active route styling to work correctly, routerLinkActive directive must be applied on the <li> element and not the <a> element. At the moment routing is implemented in the root module - AppModule. However, for separation of concerns and maintainability, it is better to implement routing in a separate Routing module and then import that routing module in the AppModule. In a later video, we will discuss how to move routing into it's own routing module. As we have seen throughout this video, there are many moving parts that we have to remember, to implement routing correctly in an angular application. In our next video, we will discuss, the routing workflow and how routing actually works in Angular, by connecting all these little moving parts. i ｢wdm｣: Failed to compile.